Ref No Grave or Memorial / Rhif cyfeirnod bedd: III. E. 8. “In loving memory of Nicholas the beloved husband of Elizabeth PRITCHARD, died 20th March 1938 aged 89 years. Also the above Elizabeth PRITCHARD died 27th April 1939, aged 82 years. Also Elizabeth Ann WILLIAMS, daughter of the above Died 13th March 1933 aged 51 years. 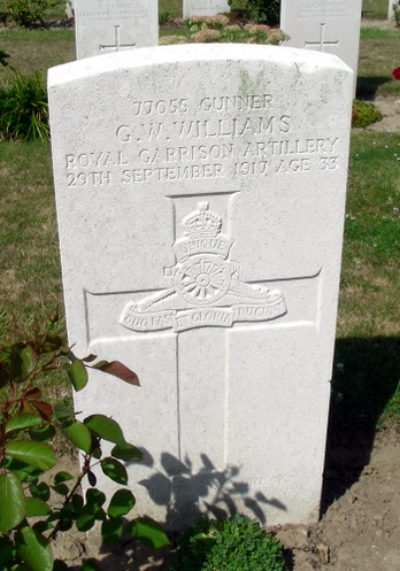 Also Gunner George WILLIAMS, R.G.A., Husband of the above Killed in Action in France Sept. 29th 1917 aged 33 years. “Duty nobly done.” Also Hilda COWBURN (Dau) Died 5th Sept. 1969, aged 80 years. R.I.P. He is also commemorated in the family grave in Overleigh Cemetery, Chester, England (Find A Grave Memorial# 136500627). George William Williams, is seen first on any census in 1891, when he was shown with his family living at 15, North Street, Chester, Cheshire. His parents were William H. And Ellen Williams (nee Weaver) who married at St. Oswald’s Church, Chester in 1884.(CE15/8/392). So by 1891 their family had grown. William H. Williams, 32, was a Locomotive Engine Driver, who had been born in Holyhead, Anglesey. His wife, Ellen, 27 had been born in Chester, as had all the children. They were George W., 6, Agnes, 4, Elizabeth E., 2 and Dorothy, 6 months old. William’s sister, Jane Ann, 25 and single was a Domestic Servant and had also been born in Holyhead, Anglesey. The 1901 census sees that the family had moved to 116, Tarvin Road, Chester. William H. Williams, 41, was still head of the household and a Railway Engine Driver, his wife Ellen, was 37. Son George, 16, was a Hairdresser Apprentice, daughter Agnes, 14, Elizabeth E., 12, Dorothy, 10 had other siblings, Robert H. 7, Frank, 4 and Eva, 1, again they had been born in Chester. This time, Ellen’s brother, Richard, 26, single and a Railway Engine Steam Raiser, had been born in Chester. In 1911 George was missing from the family home, but living, I believe, at The Cross, Malpas, Cheshire, in the household of Mary E, RICHARDS, 3 sons and 2 daughters was George RIGG, 26 single and a Chemists Assistant, born in Edinburgh (Resident) and George WILLIAMS, 25, Single Hairdresser born in Chester, Cheshire. George, I believe, was to marry Elizabeth Ann Pritchard in St. Paul’s Church, Chester in 1916 (CE16/3/90). However, Elizabeth Ann was seen on the 1911 census living as a Domestic Servant at Inglewood, 8, Glan Aber Park, Chester in the household of William Robert Redman who was an Inspector of Schools for Cheshire County Council. His wife, Florence and their daughter Mary,10. Elizabeth Ann Pritchard, 25 was single and had been born in born Llanelly, Carmarthenshire. St. Deniol’s Churchyard -Monumental Inscriptions Volume 1V North Extension, East Side. – Lovelock. – Page 49 Gunner George W. WILLIAMS R.G.A. September 29th 1917 age 33. 77055 of Chester, Husband of Elizabeth Ann WILLIAMS of Mona Cottage, Queensferry. Commonwealth War Graves Commission additional information: Son of William Henry and Elizabeth Ellen Williams, of Chester; husband of Elizabeth Ann Williams, of Mona Cottage, Queen’s Ferry, Chester. George William Williams in the UK, Soldiers Died in the Great War, 1914-1919 confirms the above regimental information and tells us he was born in Broughton, Chester and enlisted in Chester. His attestation papers state that he was 30 years and 8 months old when he enlisted on the 24th November 1915. His Trade or calling – Master Hairdresser. Are you married – No. Next Paper – Statement of the Names and Addresses of all the Relatives of the above -named deceased Soldier in each of the degrees specified below that are now living. The names of wife and his mother and father (as above) at the addresses above were written. However there was only 8 siblings named. – Robert Hugh, 25, Albert, 18 and Dennis,16, were named under Full-Blood Brothers. All living at 126. Tarvin Road, Chester. Brother Frank was not mentioned. Elizabeth Ellen Yates, 30, Mawdesley, Vicars Cross. Dora Kennerdy, 28 4, Lord St., Chester. Declaration was filled in by Elizabeth Ann Williams, Mona Cottage, Queensferry, Nr. Chester and witnessed by R.N? EVANS J.P, Queensferry on the 2nd June 19 0? Next Paper was regarding the disposal of the Plaque & Scroll to Elizabeth Ann. Next Paper – Asking Elizabeth Ann to sign for the receipt of George William’s private property dated 18th February 1918. – Letters, Photos, wallet, small photo case, leather Cig. Case, purse, 2 handkerchiefs, box containing- 2 prs scissors, pr hair clippers, 2 combs, 2 razors, belt with split ring. Next paper – Dates of postings etc., but stated that he left Catterick to be posted overseas on the 5th September 1917, he was “In the Field” on the 12th September 1917 and was killed in action on the 29th September 1917, – 17 days later. Disembarked – Salonika 20th August 1916. George W Williams in the British Army WWI Medal Rolls Index Cards, 1914-1920 does not tell us where his first Theatre of War was nor when he entered it.